Sahkarita Vibhag recruitment of Junior Salesman jobs. For Scheduled area candidates minimum qualification is 10th class. Preference will be given to the candidates who are having ITI Computer certificate or degree in computers. Most preference will be given to the Commerce Degree having candidates for this MP State Cooperative Junior Salesman Jobs. Candidates who are interested they can apply online before the closing date of 28-09-2018 through official website of www.mponline.gov.in. Candidates selection for this MP State Sahkarita Vibhag Junior Salesman jobs will be based on merit in qualifications. 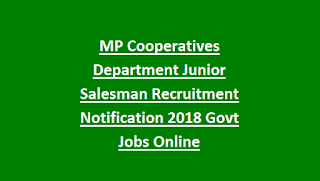 More information about this MP Cooperatives Dept recruitment Jr Salesman age limits, application fee, how to apply online and other details are given below. 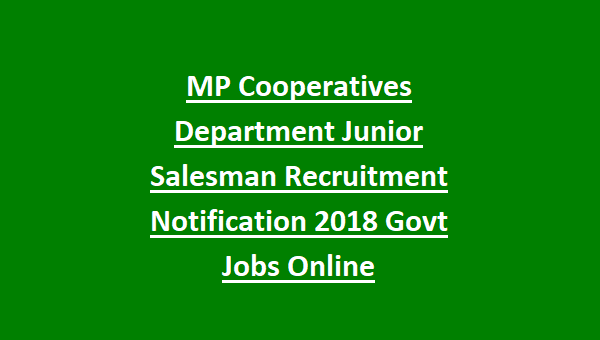 There are total 3629 Junior Salesman Jobs in this MP Sahkarita Vibhag recruitment 2018. Upper age limit as on 01-01-2018 for male general candidate is 40 years. And for all other candidates upper age limit is 45 years. Minimum qualification is 12th pass for this MP Cooperatives Vacancies. For Scheduled area candidates minimum qualification is 10th class. Preference will be given to the candidate who is having Computer Knowledge certificate of at least 6 months training or Degree computers. Most preference will be given to the candidates who are having Commerce Degree. Salary will be Rs.8400 + Rs.6000 commission. Application fee is Rs.200/- for this Jr Salesman jobs of MP Cooperatives Recruitment. Candidates selection will be based on merit in educational qualifications. Selection will be held for 150 marks. Candidates who are interested they can apply online for this MP Sahkarita Vibhag Junior Salesman vacancies before the closing date of 28-09-2018. Official website to apply online is www.mponline.gov.in.